Universal Music Singapore is pleased to announce Wanting’s concert debut, presented by Logitech UE in Singapore on 19th Jan 2013, 8pm at The Star Theatre, The Star Performing Arts Centre! Start off 2013 with Asia’s fastest rising sensation, Wanting! Canada-based English-Mandarin singer-songwriter, Wanting, first soared to fame with originals in both English and Mandarin from her debut album “Everything In The World”. Wanting’s soulful music and heartfelt lyrics, paired with her determination, drive and cheerful disposition has seen her achieve stunning success in 2012! Her album “Everything In The World” has sold over half a million copies in Singapore, Canada, North America, China, Hong Kong and Malaysia, just to name a few, and achieved GOLD in Singapore! Debut single by Wanting, “我的歌声里” (You Exist In My Song) also charted on Yes 93.3FM and peaked at #1 on iTunes Music Store in Singapore! With her compelling ability to connect with fans from all over the world, thousands have flocked to catch Wanting live the past year. Wanting has performed to sold-out crowds across China, Hong Kong, New York, Los Angeles, Toronto and Vancouver, and has headlined various shows and festivals in front of audiences of over 40,000. At the recent Global Chinese Music Awards 2012, Wanting bagged THREE top awards based on her debut album alone such as Outstanding Regional Artiste Award (Beijing), Top 20 Hits of the Year and Most Potential New Artiste Award. These prestigious accolades have since secured her status as one of the world’s most talented newcomers to the international music scene. 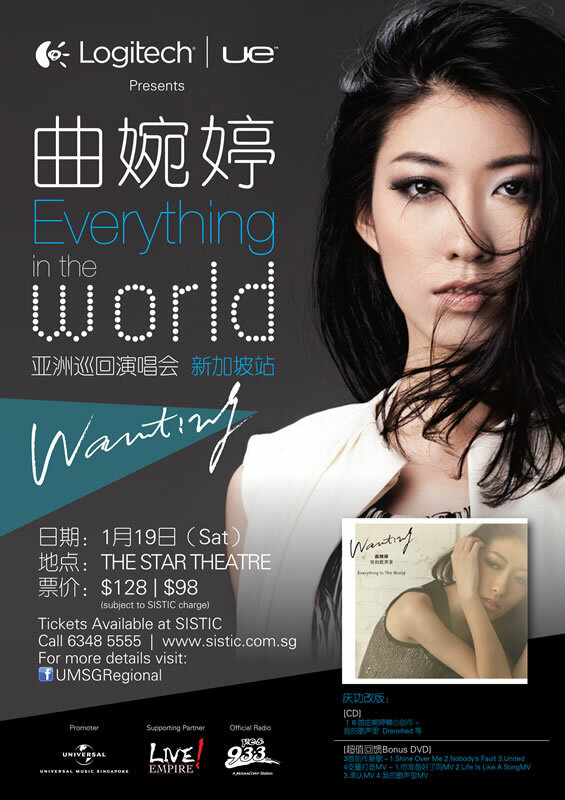 Deemed as one of the most highly anticipated concert debuts in Singapore, be prepared to be blown-away and captivated by Wanting on 19th Jan 2013 at The Star Theatre, as she performs her glorious hits like “You Exist In My Song”, “Drench”, “Everything In The World”, “Life Is Like A Song” and many more!